Disney Infinity 3.0 Star Wars Starter Pack ups the ante with triple-A gameplay and enhanced Toy Box creations tools for the well-established toys to life series. Although the toys lack innovation and purchasing is somewhat complex, the Star Wars brand shines through to make for an impressive interactive gameplay experience. As with other games like this – think Lego Dimensions and Skylanders SuperChargers – players access content by placing plastic figurines on the USB Infinity Base peripheral. This not only unlocks the characters to play in the game but also saves progress and upgrades back to the toy automatically. This year's Disney Infinity 3.0 update comes with perhaps the most significant payload for its target younger audience: Star Wars figurines. Just in time for the next feature film. This content, along with classic Disney, the characters from Inside Out, and upcoming additions from Marvel, make Disney Infinity 3.0 a franchise powerhouse. But is it the best toys to life game to date? The challenge in assessing all this is the sheer amount of content on offer. Disney has pulled out all the stops this year, not only with Star Wars but also by bringing in additional triple-A developers like Ninja Theory and Sumo Digital to bolster every part of the game. Mirroring how the average family will experience the game, we've assessed the game based on the Star Wars Starter Pack, setting aside the add-on content – including the Rise Against the Empire play set for Episodes IV-VI, Mario Kart style Toy Box Speedway & Toy Box Takeover, and Inside Out adventures – for the time being. But if you've got the cash flow these additions can act as ongoing upgrades, rather than forking out for an entirely new game each time. The Star Wars Starter Pack still has a lot of content to offer though. First and foremost is the Twilight of the Republic play set that covers content from Star Wars Episodes I-III along with some additional characters from Rebels and Clone Wars cartoons. It's also cheaper than its competitors this year, priced at £45, although this comes at the expense of losing the previously packed-in Toy Box mini games, which are now sold separately at £15 a piece. 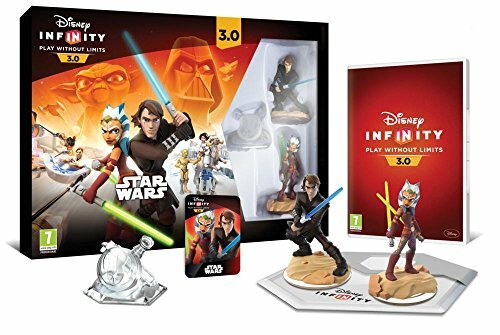 In the box you get the Disney Infinity 3.0 game disc (ensure you buy for the correct console), Ahsoka Tano and Anakin Skywalker figurines, the Disney Infinity Base (to unlock and "transport" figurine characters into the game on screen), and the Twilight of the Republic play set. Developed by Ninja Theory, building on the engine created by Avalanche Software, Disney Infinity 3.0 in particular improves the already robust combat system by adding more player controlled moves and a greater sense of impact. Lightsabers feature, but of course, both for use in melee and when deflecting incoming blaster fire. It's spine-tingling stuff as you take control of these iconic characters. The game is set between Episodes II and III in an adventure through the Clone Wars-era galaxy to battle Darth Maul and the Separatists. The basic premise being that a droid factory on Geonosis has been activated and the Jedi must discover who is behind it. The other most telling gameplay addition this year is the space travel system. Progressing through the Twilight of the Republic play set takes you to different Star Wars planets – Geonosis, Tatooine, Coruscant, and Naboo – via an impressive star map. This involves missions set in space as well as on planets' surfaces, adding a whole new, ahem, dimension to Disney Infinity (yes Lego fans, we've been playing Dimensions too). Players need to collaborate closely to finish missions in good time, which creates a great sense of tension in deep space. There are hundreds of enemy ships, all backed by massive Destroyers and asteroid fields, which looks great. On-foot missions also work well with a full complement of iconic vehicles, locations and characters from the films and cartoons. This is more familiar fare and doesn't stray far from other Disney Infinity adventures, but the Star Wars aspect of the game is well pitched and engaging throughout. It's with the figurines that Disney Infinity 3.0 feels less innovative though. Whereas competitors like Skylanders SuperChargers and Lego Dimensions are developing the toy side of the equation as much as the on screen action, Disney Infinity has stagnated somewhat. The characters are still beautifully sculpted and detailed, but physical playability hasn't developed since the first game. The articulated vehicles of SuperChargers and buildable Lego sets of Dimensions both offer much more engagement and value on the carpet. Another downside is not being able to use any character you want in the play set adventures. With Lego Dimensions breaking this wall and allowing players to mix and match franchises – even when having Scooby Doo drive the Batmobile doesn't make sense within the fiction, but that's what play is all about – Infinity's insistence on preserving these brand divisions may frustrate. More positively, you can now use any of the new Star Wars characters in the Twilight of the Republic play set once you have collected their cross-over coin. This improves on last year and lets you pull in Star Wars heroes even when they technically shouldn't exist in that particular timeline. As ever Disney Infinity's crown jewels is the Toy Box. Here the gloves come off and any characters can be combined together, creating your own worlds and ideas. Not only that but an array of improved editing and game-logic creation tools make for quick and easy ways for young imaginations to come to life. It takes a little time to get started, but once you have the basics down there is a surprising amount of game development you can do. Certainly, budding game designers will find a lot of educational benefit. The best of these community level creators have even been offered work at Disney Interactive in the past – so there is a real incentive to shine. On balance the Twilight of the Republic Starter Pack offers great value for families. However, care should be taken that this is the favoured content in the game before purchasing – there are plethora of ways to start playing. If you prefer to focus on this Rise of the Empire content without also spending on Twilight of the Republic, they should wait a month for that to be released standalone. At launch the Episode IV-VI is only available via the more expensive PlayStation Special Edition. If you already have the Disney Infinity 2.0 or 1.0 Infinity Base then save money by just purchasing or downloading the game disc and pairing that with a play set of your choice (caveat: the Xbox One base only works for Xbox One; the Wii, Wii U, PS3 and PS4 bases are compatible with each other, whichever platform you use). This is not only cheaper but means they can choose the content. This is a good route, for instance, to start playing the Inside Out play set for those not interested in Star Wars – apparently there are some. There is also a Marvel Battlegrounds play set coming in the future that some may want to save their pennies for, rather than jumping in at launch. This will offer four person multiplayer adventures and support any of last year's Marvel heroes. Overall Disney Infinity 3.0: Star Wars is a great addition to the toys to life series. However, the phased release purchasing makes the experience somewhat complicated, especially for parents. Kids will grasp all the additional content play sets and, no doubt, want the lot - not just the Star Wars ones. But that's how toys to life games work: it's about collecting as much as it is playing the game on screen. A shame, then, that the Disney toys lag behind Lego Dimensions and Skylanders SuperChargers on a playability front, as they're one dimensional and can't be crossed over between Disney franchises to create new, imaginative combinations. Setting these technical quibbles aside though, fans of Clone Wars, Rebels and the recent Star Wars films will find good value in the Disney Infinity 3.0: Star Wars Starter Pack. It's the ultimate game for fans and families.